Recipe for Peinirli (pronounced peeneerlee). This dish was brought by the Greeks who lived by the Black Sea and had to emigrate to Greece almost 100 years ago. It is a boat-shaped bread with a buttery-cheese filling, though meat can also be added. 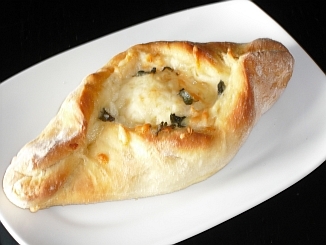 The name derives from the Turkish word peynirli, meaning 'with cheese'. The best-known places to eat this in Greece are probably in the suburb of Drosia, outside Athens and Panorama outside Thessaloniki. I remember enjoying it in Panorama (then called Arsakli) as a child, when the Peinirli was more than a snack, but a main dish in itself, and you could break off the bread and dip it in the runny cheese before putting it in your mouth. Wonderful! This recipe is for 8 peinirlis and if you wish to add ham and bacon, this is included as optional. Greek Kaseri cheese is best, but if you can't get this, then use a yellow cheese that melts easily. Warm the milk to make it slightly tepid and put in a mixing bowl. Add the honey and dissolve it. Add the yeast and dissolve it. Mix the 2 types of flour together and then add 200g of this mixture to the milk and mix well. Cover the bowl with cling film and leave in a warm place for 30 minutes, to activate the yeast and rise. Put the remaining flour in a large bowl and add the salt and melted butter. Beat the egg in a little tepid water and add to the mixture. Add the flour and yeast mixture to this mixture and knead well, adding some tepid water to make a non-sticky pliable dough. Cover the bowl with cling film and leave in a warm place for approx. 1 hour until it has doubled in size. Roll each ball out flat and give them an oval shape. Spread the grated cheese lengthwise in the centre of each one. You can sprinkle a few leaves of oregano on top if you wish. Looking at the dough with the oval-shape horizontal in front of you, take the top left and bottom right corners and fold them in a little bit toward the centre. Then take the top right and bottom left corners and do the same. Pinch the two ends of the oval together so that you get the boat-like shape (see photo). Cut the 150g butter into 8 equal pieces and place in the centre of each. Sprinkle a shallow oven dish with some flour, place the 8 peinirli on it and leave in a warm place for 30 minutes. Then put them in a pre heated oven at 250 degrees Celsius for 20-30 minutes, until they are golden brown.